Effective in a small area only. Ideal for home, office cabin, kitchen. It has a unique oil reservoir lubrication that ensures reliability and long life. It has a novel base design and decorative style. A seek and stylish fan with Elegant Look. Superior technology for enhanced air thrust. 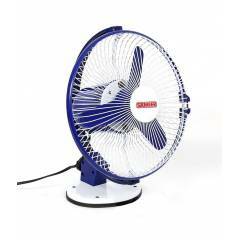 Sameer 230 mm White Wall Fan, PW-01 is a premium quality Wall Mounted Fans from Sameer. Moglix is a well-known ecommerce platform for qualitative range of Wall Mounted Fans. All Sameer 230 mm White Wall Fan, PW-01 are manufactured by using quality assured material and advanced techniques, which make them up to the standard in this highly challenging field. The materials utilized to manufacture Sameer 230 mm White Wall Fan, PW-01, are sourced from the most reliable and official Wall Mounted Fans vendors, chosen after performing detailed market surveys. Thus, Sameer products are widely acknowledged in the market for their high quality. We are dedicatedly involved in providing an excellent quality array of Sameer Wall Mounted Fans.